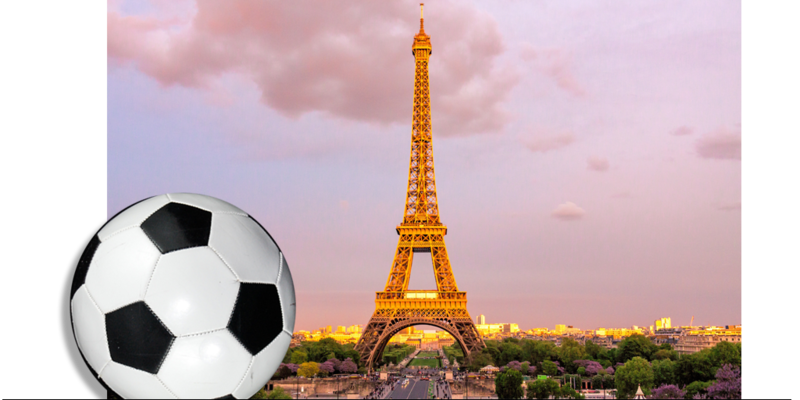 The World Cup has finally concluded with France becoming champion for the second time. Although disappointed at not seeing England played in the final, I certainly enjoyed all the drama on pitch. In my previous post, we had a poll to get opinions from The Minitab Blog readers on who they thought would win in the final. Now, it’s time to look at the results and see how many of our readers have the ability of Nostradamus (Did I mention he’s French?). Before looking at the results of the survey, let’s look at the probabilities of winning the tournament for the last 8 teams generated from the model in my previous article. Moving on to see the results, we have first of all the bar chart below showing the voting results for the teams. Respondents only selected five out of the total eight teams. And it appears no one could have guessed Croatia would be in the final. About 33% of readers believed France would win, followed by 24% for Brazil. 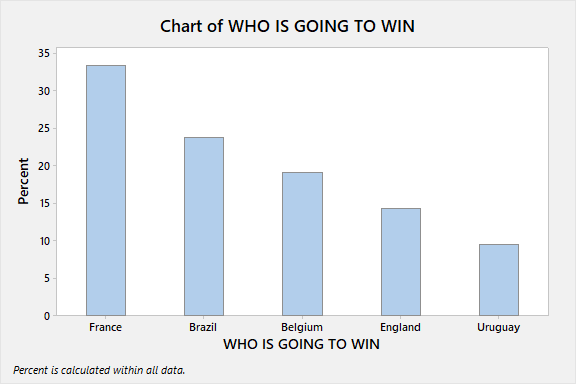 However, looking at the probabilities from the model, France has a smaller probability than Brazil. Based on the model, Uruguay had the highest probability of achieving first place while it is the least favorite in our survey. Apart from asking readers who they think will win the World Cup, we also asked where they are from. 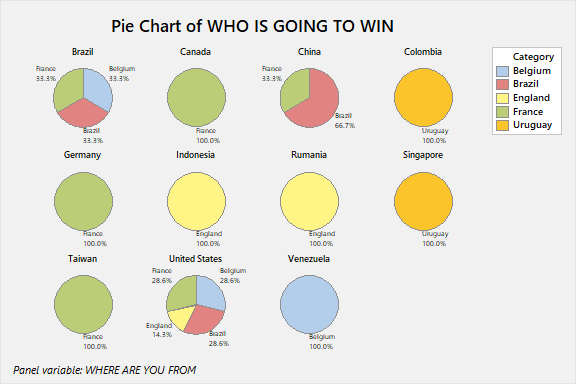 Using the data, we have the pie chart below showing the choices of readers from different countries. Interestingly, only one third of Brazilian readers believe their national team would win while Chinese readers are strong supporters of Brazil. Canadian readers fully support France and I do wonder if these readers are from the French-speaking region of Canada. On the other hand, respondents from Germany fully support France while readers from Colombia fully support Uruguay. Does this imply they switched support to neighboring countries after the national team were out of the tournament? 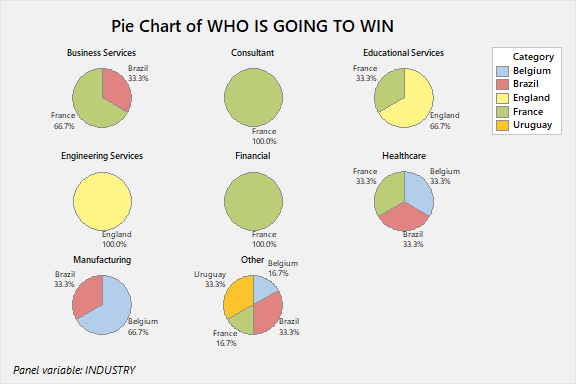 Readers from engineering industries are strong supporters of England while respondents from financial services and consultancy services support France. The survey has indeed given us some interesting results and observation. Now the wait to see England in the next World Cup has begun for me!